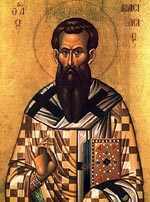 Almighty God, who hast revealed to thy Church thine eternal Being of glorious majesty and perfect love as one God in Trinity of Persons: Give us grace that, like thy bishop Basil of Caesarea, we may continue steadfast in the confession of this faith, and constant in our worship of thee, Father, Son, and Holy Ghost; who livest and reignest for ever and ever. Amen. Basil was born in Caesarea of Cappadocia, a province in what is now central Turkey (more or less directly north of the easternmost part of the Mediterranean, but with no seacoast). He was born in 329, after the persecution of Christians had ceased, but with parents who could remember the persecutions and had lived through them. He originally planned to become a lawyer and orator, and studied at Athens (351-356), where two of his classmates were Gregory of Nazianzus (who became a close friend) and the future Emperor Julian the Apostate. When he returned home, the influence and example of his sister Macrina led him to seek the monastic life instead, and after making a tour of the monasteries of Egypt in 357, he founded a monastic settlement near his home. He remained there only five years, but the influence of his community was enormous. Whereas in the West there are numerous monastic orders (Benedictines, Carthusians, etc. ), in the East all monks are Basilian monks. His Longer Rules and Shorter Rules for the monastic life remain the standard. Basil expresses a definite preference for the communal life of the monastery over the solitary life of the hermit, arguing that the Christian life of mutual love and service is communal by its nature. In 367-8, when Cappadocia suffered a severe and widespread famine, Basil sold his family's very extensive land holdings in order to buy food for the starving, persuading many others to follow his example, and putting on an apron to work in the soup kitchen himself. In this crisis, he absolutely refused to allow any distinction to be made between Jew and Christian, saying that the digestive systems of the two are indistinguishable. He also built a hospital for the care of the sick, housing for the poor, and a hospice for travelers. These were the years between the First Ecumenical Council (Nicea, 325) and the Second (Constantinople, 381), years in which it was uncertain whether the Church would stand by the declaration made at Nicea that the Logos (the "Word" -- see John 1:1) was fully God, equally with the Father, or seek a more flexible formula in the hope of reconciliation with the Arians, who declared themselves unalterably opposed to the Nicene wording. Basil had been ordained priest in 362 in order to assist the new Bishop of Caesarea, whom he succeeded in 370. (Since Caesarea was the capital, or metropolis, of the province of Cappadocia, its bishop was automatically the metropolitan of Cappadocia, which included about fifty dioceses (bishoprics). A metropolitan was roughly what we would call an archbishop, although in ancient terminology an "archbishop" was one step above a metropolitan.) By that time, an Arian emperor, Valens, was ruling. Basil made it his policy to try to unite the so-called semi-Arians with the Nicene party against the outright Arians, making use of the formula "three persons (hypostases) in one substance (ousia)," thus explicitly acknowledging a distinction between the Father and the Son (a distinction that the Nicene party had been accused of blurring), and at the same time insisting on their essential unity. When the emperor Valens passed through Caesarea in 371, he demanded the theological submission of Basil, who flatly refused. The imperial prefect expressed astonishment at Basil's defiance, to which Basil replied, "Perhaps you have never met a real bishop before." Valens retaliated by dividing the province of Cappadocia into two provinces, with the result that the Arian Bishop of Tyana became metropolitan of the new province of Western Cappadocia. Basil responded by going political. He ramrodded his brother Gregory of Nyssa and his friend Gregory of Nazianzus into bishoprics that they did not want, and for which they were totally unsuited, so that he would have the votes of those bishoprics when he needed them. (Neither Gregory ever quite forgave him for this.) His interests were not exclusively theological: he denounced and excommunicated those who owned houses of prostitution, he worked to secure justice for the poor against those who oppressed them, and he severely disciplined clergy who used their office to accumulate money or to live too well at the expense of the faithful. His most famous writings include the Hexaemeron ("The Six Days"), a series of nine sermons on the days of creation, in which he speaks of the beauties of the created world as revelations of the splendor of God. His Against Eunomius defends the deity of Christ against an Arian writer, and his On the Holy Spirit speaks of the deity of the Third Person of the Trinity, and the rightness of worshipping Him together with the Father and the Son. In his Address to Young Men (originally written for his nephews), he urges Christians to make themselves acquainted with pagan philosophy and literature, arguing that this will often lead to a deeper understanding of Christian truth. His personality comes through most clearly in his letters, of which more than three hundred have been preserved. Some deal with points of theology or ethics, some with canon law, and many simply with everyday affairs. Ten times a year the Eastern churches use the Liturgy of St Basil rather than the more usual Liturgy of St John Chrysostom. It differs chiefly in having a more elaborate Anaphora (the prayer of consecration offered over the bread and wine), expressing some of his characteristic turns of thought, probably dating back to his time and used by him, and possibly composed by him personally.